Your LLHS is celebrating 60 years of partnering with families to educate, encourage, and equip students for life and for eternity. We are grateful, encouraged, and energized by the community’s generosity and support throughout the decades. As part of #GivingTuesday on November 27, 2018, we invite you to donate and help us help future in-need families make Christian education possible. 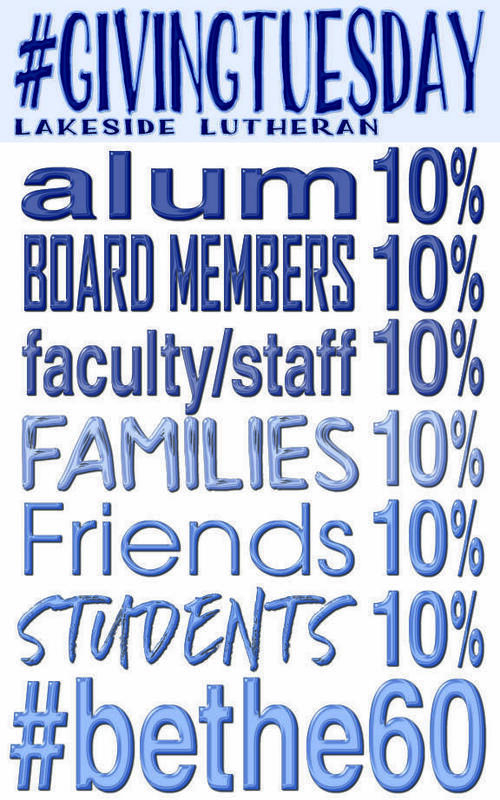 Our campaign #bethe60 goal is for 10 percent participation by six groups (alum, board members, faculty/staff, families, friends/community, and students) to represent the 60 years, past and present, of Lakeside. Give online here or by mail: LLHS #bethe60, 231 Woodland Beach Road, Lake Mills WI 53551. If giving by mail or drop off at the office, feel free to download the form below and share your category!